Vega Vitamins Selenium functions synergistically in the body with vitamin E as a potent antioxidant, preventing the oxidation of lipids (fats). Selenium may help to support the immune system and it`s functions, and may help protect and maintain vital body organs such as the heart, liver, lungs, pancreas and thyroid glands. Vega Base (Acacia Gum, Fruit Juice Concentrates (Aronia, Apple, Elderberry, Blueberry & Blackcurrant)), Vegetarian Capsule Shell (Hydroxypropyl Methylcellulose, Colours (Titanium Dioxide, Copper Chlorophyllin)), Anti-caking Agent (Magnesium Stearate), Dicalcium Phosphate, L-Selenomethionine. 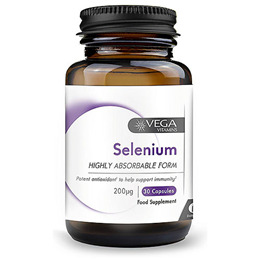 Below are reviews of Vega Vitamins Selenium - 30 x 200mcg Capsules by bodykind customers. If you have tried this product we'd love to hear what you think so please leave a review.